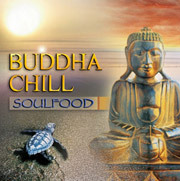 Buddha Chill is a world tour of DJ beats, chill grooves, Asian soundscapes and global rhythms. Recordings from Corsica, Thailand and Uzbekistan add to this release�s exotic feel. SOULFOOD�s DJ Free, who has charted on Billboard and international DJ and Dance Charts, returns to his club roots by fusing together acoustic instrumentation, sensual vocals, and ambient soundscapes to create transglobal electronica.